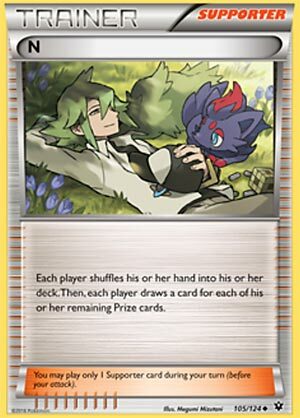 N was first released in BW Noble Victories and its recent print is XY Fates Collide. It was reviewed three times: as a regular review (https://www.pojo.com/COTD/2011/Nov/14.shtml), the fifth best card of 2011 (https://www.pojo.com/COTD/2011/Dec/1-2.shtml), and the second best card lost to rotation of 2015 (https://www.pojo.com/COTD/2015/Aug/6.shtml). I even throw a late card review on my part (https://www.pojo.com/n-late-pokemon-card-review/). This card’s effect isn’t new; another card that originally does that is Rocket’s Admin. I used to keep thinking that this was a great card based on older reviews, but I had to consider other stuff. Once again, I read 21times’s review and I had to erase two of my paragraphs because I changed my mind about this card. There is just some scenarios that are good and some that are bad. Scenario 3: you got a better hand and your opponent has a bad hand. Scenario 4: you got a bad hand while your opponent has a better hand. Scenarios 1 and 3 should be your ideal outcome for N. And if you thought you can use N when your opponent is down to their last prize card, they may have Pokémon with ability based draw that can get your opponent out of a tight spot. Octillery, Zoroark-GX, and Oranguru…………those Pokemon can recover your opponent’s hand deficit should you try to being down their hand size. As for the Legacy Format, Magnezone Prime and Electrode from BW Plasma Freeze can replenish your hand. N will be missed though. There isn’t some sort of replacement that does a similar thing, though Wicke comes close, as she shuffle both players’ hand and draw adds based on how many cards in their hand before it gets shuffled. Judge also shuffle both players’ hand and draws four cards. Do mind that the same set of scenarios apply to those two supporters. In limited, since both players start the game with four prize cards, either player can only get four cards at best. Conclusion: Cards can be great at one point and suddenly fumbles as time passes due to some shortcomings. Before the edit, I previously gave this card a 4.75/5 because of the fixation that N is one of the big draw supporters. But that’s not the case now. N… sigh. It’s the most misused card in the game. Most of the time when you play it, you give your opponent more cards than he had previously. If you give your opponent more cards, chances are you’re improving his hand. That’s not just common sense, it’s a fact. I did a study on it… twice. It’s published here on the site. And the late game N your opponent down to one card? It’s a myth. It’s a red herring. It’s fake news. Between May 19 and June 23, Zoroark GX was in 26% of decklists. Octillery was in 33% of decklists. Oranguru was in 9 % of decklists. Do the math: two thirds of the decks you go up against can refresh their hand after the late game N.
Have I lost to the late game N? Absolutely. Aaron Tarbell beat me twice with late game N’s in Collinsville. It’s not like it can’t ever work. But the majority of the time, N helps your opponent more than it hurts him. I’ll say it again: the majority of the time, N helps your opponent more than it hurts him. Why would you play a card that helps your opponent? I’m a little sad N’s leaving the format. Now what am I going to do when I get a Greninja hand turn 1 and need my opponent to bail me out with an opening turn N? And all the times when I have only two cards in hand and my opponent is kind enough to refresh my hand full back up to six. Ah, those are the times when I’ll really miss N.
I actually used N quite a bit. I always ran four in spread decks and in Greninja and when we had to review bad cards here on Pojo that I knew would struggle, then I included N as well. Decks I knew I was going to fall behind (or lose with), I always carried four N in those decks. What I’d argue is the second best (or at least, most influential) card we’re losing due to the pending Standard Format rotation on September 1, 2018, is N. Please read this, even though I cannot make it as concise as I would like; I strongly disagree with my fellows, though I respect them and have considered their views. I may be completely wrong, but let me present my case. N is a Trainer-Supporter that (when used) forces both players to shuffle their hands into their respective decks. Then, each player must draw a number of cards equal to the amount of that player’s remaining Prize cards. This is almost identical to the effect of a much older Supporter, Rocket’s Admin (EX – Team Rocket Returns 86/109). Besides wording differences that do not affect gameplay, Rocket’s Admin. does not force either player to draw after shuffling away his or her hand; instead, it allows each player to draw up to an amount equal to that player’s remaining Prize cards. As I’ve failed to notice this difference at times, I like to highlight it when given the opportunity. What these mean is that, for the Standard Format, N was introduced a few months into the 2011-2012 (HS-On) Format and was present for all of the 2012-2013 (BW-On), 2013-2014 (NXD-On), and the 2014-2015 (BCR-On) before it was absent the first three-quarters of the 2015-2016 (XY-On) Format, then legal for all of the 2016-2017 (PRC-On), and 2017-2018 (BKT-On) Standard Formats. N quickly became a staple after it released, even though Professor Juniper (same attributes and effects as Professor Sycamore) and Professor Oak’s New Theory (same attributes and effects as Cynthia) were both already legal. Even after Professor Oak’s New Theory left, N remained a staple until that XY-On rotation temporarily gave it the boot. Which is not to say that every competitive deck ran it; yes, I AM using staple rather broadly, but the exceptions were few and for the times when a deck ran zero or one, I recall more times when running two or three or even a full four was the norm for competitive decklists. Right now, for example, three or four is the norm. It is quite possible that this will change with the release of SM – Celestial Storm, but even if it does, N has enjoyed an amazing run. Early game, he’s a reliable shuffle-and-draw-six card; since losing Professor Oak’s New Theory we had no alternative until Cynthia. There were other shuffle-and-draw cards, but with caveats that reduced their overall efficacy. Speaking of which, most (if not all) draw Supporters carry the risk of leaving you with a worse hand than when you started; after all, you burn your Supporter for the turn by using them. Late game, N is a somewhat reliable form of disruption. Yes, your opponent may get draw into a better hand than he or she had before, or at least one that is just as good. That is always a risk if you’re using a shuffle-and-draw form of disruption, and can even be a risk with straight discarding effects. Your opponent may have an “anti-N” effect like the Ability from Octillery (XY – BREAKthrough 33/162) which allows them to rebuild their hand after it was shrunk, maybe even improve it… but you had to be desperate to shuffle-and-draw yourself or you had to misread their hand situation for this to really be a drawback. If they had a decent hand they could play down to the same amount N left them… then at least you forced them to use Octillery before doing such a thing. With no N, you risk that same opponent burning through his or her hand, using a Professor Sycamore, playing down his or her hand again, before finally using Octillery’s Ability and playing a few more cards. It is important not to confuse “hand size” with “hand quality”, either; a single card hand can be better than a six card hand if the single card is the right card and the six cards are the wrong cards. Which is why gathering data on N usage is very difficult; you need to know exactly what both players are running (decklists) and have in hand at the time. You need those players to both be fairly competent, if not outright skilled because N is one of those cards that is very easy to use poorly. When you judge whether or not N helped or hurt the player using it, you must consider the net effect; helping my opponent out is okay if I helped myself out more. Giving myself a worse hand is okay if I gave my opponent an even worse hand. While using a Supporter and getting a hand no better than what you had before is a bad result, using a Supporter to draw a better hand for yourself while leaving your opponent no better or worse off may still be a good result. Which might explain why, at the North American International Championship that was recently held in Columbus, OH (USA). 1534 Masters participated, and the top eight contains some very familiar names, like Tord Reklev. Looking at that top eight from over 1500 players, we see that sixth place finisher Edward Kuang ran no copies of N in his deck. Everyone else ran either three or four copies of N.
After all of that, I’m here to tell you that I am happy N is going away. WHAT?! N is a great, powerful card. Too powerful. I blieve it was supposed to be balanced by hitting both players technically equally; early game you both benefit from a shuffle-and-draw-six, late game you both suffer from a shuffle-and-draw-one. If you pull ahead through luck, N slaps you on the hand… or smacks you in the jaw if you pulled way ahead. N can’t tell when you pull ahead through skill, and the luck-of-the-draw is still present the entire time, hence the criticisms about N helping your opponent more than yourself and the praise when it helps you so much more than your opponent. I’d rather go back to a time when grooming your hand and preparing a few turns in advance was as important as thinning your deck, or at least not almost totally unimportant. I’d rather they fix the actual gameplay issues that allow a player to luck into a 1-6 (Prizes remaining) lead instead of punishing one person for playing well while rewarding the other for playing poorly. Next articleYu-Gi-Oh! Hidden Summoners Coming This Fall!